Top Sound System Brands for Events ! Top Tour Sound Brand in the world ! The sound systems are the backbone of any music concert, Live Band performance, GIGs and other DJ and EDM parties. And the quality of sound is totally depends on the Brand of Sound System. We at hire4event having all kind of music system equipment of top sound system brands in house. This is most famous and most used sound for tour and big EDM Festivals. This is a Samsung owned company named HARMAN, based in U.S.A which include many brands like SOUNDCRAFT, CROWN, AKG, AMX, BSS. DBX, DIGITECH, LEXICON, MARTIN, have very good speakers like SRX, VRX, STX, VERTEC, VTX, JRX, EON, etc. Apart from speakers harman manufacture mics, amplifiers, DI Boxes, equalisers, lights like LED Par, Sharpies, Wash, etc. 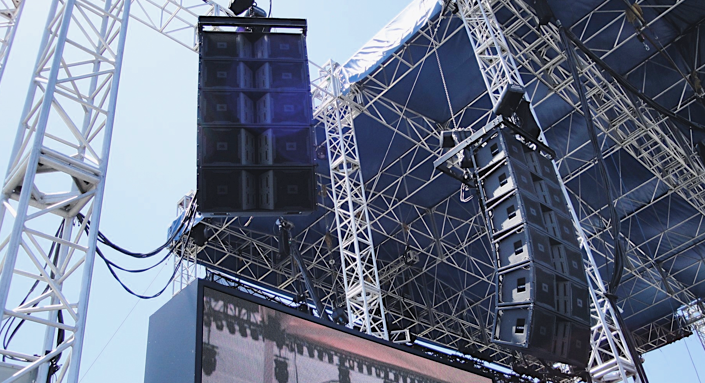 Jbl produce high end sound system for small to large scale concerts and tour sound starting from conferences to gigs. It is a Italy based company which manufactures Powered and passive sound with best in its class. This brand is covering market very fast in India because active sounds are easy in installation and less time time consuming. Famous and best selling models are HDL20, HDL30, TTL 55, TTL 33. This is most premium brand in tour sound headquartered in France best series are X series, P series, K series etc. Best in clarity and loudness LA provides best after sales support. This brand is very costly so less availability in sound rental market in India. A Germany based company have high range in professional audio system provide solutions is line-array and tour sound with high end outputs. Manufactures complete solution like PA, Base-bins, Monitors, side-fills etc. Best series are 10AL, 10AL-D, GSL8 loudspeaker GSL12, J8, J12, KSL8, KSL12, T10, V8, V12, VI8,V12, Y8,Y12 etc. Valencia, Spain based company manufactures high level line arrays systems the international standard for sound reinforcement, professionals for quality audio production. Compact in size easy to installation with high outputs have unmatched sound quality. There are many famous series like Aero 8A, AERO 12A, AERO 20A, 40A, AERO50, Action , Altea, Arco, Artec series, Quantum, Event series specially for entertainment sound production. Europe based company head-office in Czech Republic have different shape and technology to provide heavy and loud sound is less number of boxes. High Technics of KV2 give state of art quality sound have some very famous series VHD5.0, VHD Series, SL Series, ESR Series, ES Series, ESD Series, EX Series etc. Eastern Acoustic works design and build the hardware and software needed for every requirement for. Permanent or touring sound for Small room to large stadium. A U.S.A base sound and audio equipment's manufacturer is famous for unique sound quality best series are Redline, Radius, KF, QX,MK Series. This company is finally takeover by RCF. Port Perry, Ontario located tour sound system making Adamson sound engineering is grabbing market. With tremendous output for large scale shows, and stadium audio requirements. Adamson is synonymous with power, durability, and clarity. Decades of research in the world's most demanding performance environments has led to the induction of technology that is unmatched in the field. Available segments are E series, CS, S, IS, M Series etc. Italy based sound manufacturer have presence worldwide have some good series like MUSE, HORIZON and MITUS. One of the worlds top premium brand in audio elements manufacturer have vast market around the Globe. Bose Professional loudspeakers have installed with excellence in sound quality and durability in some of the world’s leading cultural arts enters, auditoriums, Stadiums, Clubs, conference and seminar rooms, live music concert venues. Its Most famous line array system is DELTA-Q . Martin Audio equipment are having international reputation and its award winning professional loudspeaker systems. Across the arena of live sound and installation applications.It is headquartered in UK. Tour sound and event series are MLA, MLA COMPACT, MLA MINI.